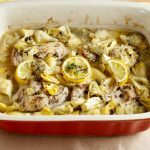 Easy, healthy, baked lemon artichoke chicken piccata. A simple, light, and tasty meal. High protein and low carb. 2 Lemons one sliced thin slices & one cut in half for squeezing. 4 to 5 Cloves garlic peeled and minced. 2 Tbsp Lemon juice from one lemon. 2 Tbsp Capers (make sure only ingredients are: capers vinegar, sea salt, water). 3 Tbsp Butter or Coconut oil. 1/2 Tsp Sea Salt * optional. Place butter or coconut oil in large casserole dish, and place in the preheating oven to melt. Slice one lemon in thin slices, and mince garlic, then set both aside. Take casserole dish out of oven once butter or oil is melted. Line bottom of casserole dish with lemon slices. Place chicken on top of lemon slices. Sprinkle the top of chicken with: minced garlic, drained capers, sea salt, and Italian seasonings. Drain artichokes of water in can, and dump all over the top of chicken. Pour lemon juice over the artichokes. Pour chicken broth over the top of the whole thing. Pour cooking wine over the dish. Cover casserole dish with foil and bake for 30 to 35 minutes or until chicken is not pink in center. Remove, cool slightly, Remove foil and return to oven for 3 to 5 minutes to lightly brown chicken. Serve.